One of the Long Island's most unique wedding and event venues is The Sea Cliff Manor, a place where tradition meets art in an awe-inspiring water view setting. Our waterfront mansion is an ideal choice for the couple who wants their wedding celebration to really stand out from the pack. Sea Cliff Manor is where Old World tradition meets modern elegance. Contact one of our professional event planners to discuss your dream wedding on the water. Sea Cliff Manor’s beautiful outdoor garden veranda overlooking the Sound is a romantic spot for the wedding ceremony or an “al fresco” cocktail hour. Ask about our winter wedding availability and special pricing. Seeing is believing - so call us to arrange a private tour of Sea Cliff Manor. We offer your guests a more personalized, elegant experience by focusing on the details such as Royal Doulton china, Chippendale chairs and gourmet cuisine. We believe you will find our reasonable prices will meet and exceed your wedding reception dreams. Browse through the variety of easily customized “Wedding Package” menus that we offer. Our experienced, on-site wedding catering and event specialists are available to assist with every detail, so you can focus on what's really important: Celebrating this special milestone with family and friends. 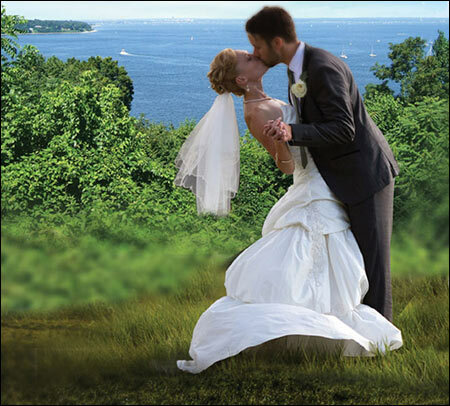 Sea Cliff Manor is an exquisite setting for both Long Island weddings and wedding receptions, combining elegant indoor and outdoor inexpensive wedding venues with the spectacular beauty of our Long Island Sound in the background. Our indoor wedding reception location is highlighted by a lovely double-faced fireplace, traditional bar area and magnificent panoramic views; while our spectacular outdoor terrace features an incomparable garden-like setting. Contact our experienced staff with any of your questions. They can help you customize your events to make it truly memorable. They all lead to us! We provide affordable Wedding Ceremony and Wedding Reception Packages that can be customized to fit your exact budget needs and wedding party desires. We pride ourselves on doing things "Your Way"!